Most agree that the original Halloween (1978) starring Jamie Lee Curtis is the best movie to watch on Halloween. In fact, even the remakes courtesy of Rob Zombie are rather good, too. But what if you're in the mood for something a little different this year or you've already seen Michael Myers slash it up more than twenty times? Not saying that there hasn't been other perfect horror films, but most of them don't actually take place on or even near the greatest holiday of the year. First of all, Hocus Pocus is not on this list - that Halloween gem is just a given at this point. Neither is Ernest Scared Stupid, no matter now much we love that gooey little troll creature. Second of all, you won't see Disney's cutesy Halloweentown movie franchise either, nor did we pick any of R.L. Stines Mostly Ghostly scary kid's movies, although we do suggest you watch them anyways. There are three things that I've learned never discuss with people: religion, politics, and the Great Pumpkin. This would not be a legitimate list without the classic animated short It's The Great Pumpkin, Charlie Brown (1966). No matter how old or young you are, the Peanuts kids never fail to entertain us, while tossing in a moral or two. 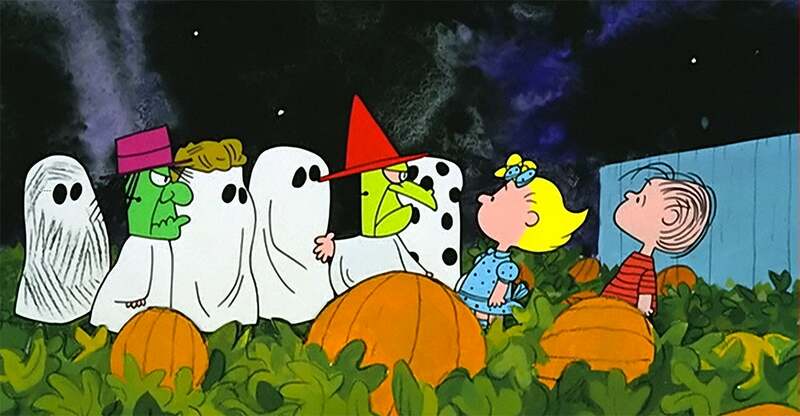 While the rest of crew is out trick or treating on Halloween night (note that Charlie Brown gets a rock instead of candy), Linus is patiently waiting in a field for the Great Pumpkin to appear. No one else believes that the Great Pumpkin actually exists, but Linus (the philosopher) is steadfast, even composing letters to the Pumpkin. We won't ruin it for you, but let's just say that the classic "leaning against the wall" conversation between Linus and Charlie Brown doesn't go too well. You're looking at vengeance... cruel, devious, pure as venom... vengeance! 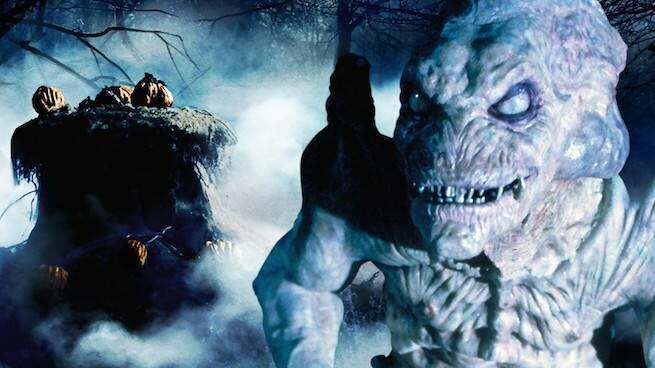 Pumpkinhead (1988) was the the directorial debut of the late special effects wizard Stan Winston, who did an amazing job convincing us that Pumpkinhead was real. Since the film's original release, it has garnered quite a cult following. It was unlike slasher movies of that era of horror films and instead focused on the theme of revenge. Pumpkinhead was a creepy, presistent, and vengeful demon that usually murdered whomever it was sumonned to to destroy. Also, this thing is really grotesque looking and will haunt your dreams. After his son dies in a hit-and-run accident, Ed Harley (Lance Henriksen) seeks revenge against the teenagers responsible. With the help of a local witch (Florence Schauffler), Ed summons the vengeful demon Pumpkinhead to hunt and kill the group of friends. But when Ed discovers a bond between himself and the creature, he begins to have second thoughts about employing the vicious monster, and he fights to end Pumpkinhead's murderous rampage before it is too late. In the end, Ed should have listened to the witch! "No vampire's gonna want him anyway. Probably give him blood poisoning." 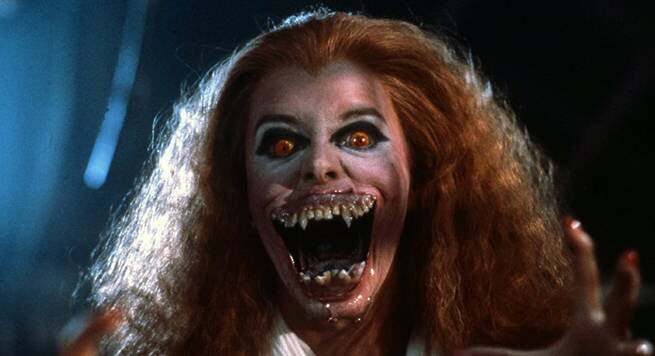 Fright Night (1985) is a classic vampire tale bordering on horror satire with gruesome practical effects. A new neighboor moves into the suburbs, and the teen next door (who is obsessed with a TV show called Fright Night) is convinced the new guy is a vampire. But of course, no one believes him - so he enlists the help of the washed up vampire hunter host of Fright Night to assist him in what ends up to be one hell of a night. Charley Brewster (William Ragsdale) is in his room with his gal Amy Peterson (pictured above) when he sees the new neighbor Jerry Dandridge (Chris Sarandon) carrying suspicious coffins into his house just as local murders are on the rise. Dandridge knows that Charley has beeing spying on him, so he scares Charley to death by showing up in his bedroom with intent to kill him. Charley escapes and vows on his life to destroy the monster next door with help from his skeptical friends and "Vampire Hunter." Let's just say that his girlfriend Amy and his best friend Evil Ed believe Charley in the end. Oh you're so cool, Brewster! 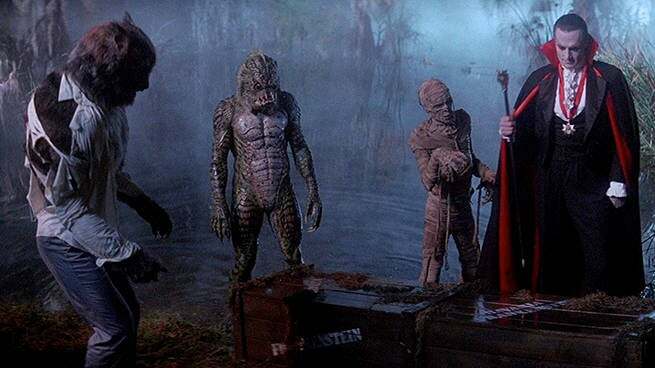 The Monster Squad (1987) is not your typical monster movie. Instead it brings together all of Universal's classic movie monsters in an hysterical yet spooky thriller starring a bunch of goofball kids. Sean Crenshaw and his best friend Patrick are die-hard monster fanatics. Along with their friend Horace (nicknamed Fat Kid), junior high tough-guy Rudy, Sean's kid sister Phoebe, and little Eugene they encounter Count Dracula. Mr. Blood Thirsty has summoned his monsters Frankenstein's creature, The Gill Man, The Mummy, and Werewolf to find an ancient amulet that will control the world. Meanwhile Phoebe becomes best friends with Creature and the entire town is in danger. After a wild and scary adventure, the fate of the world is up to Patrick's sister, who claims that she is virgin, to read a special passage that will send the monsters back to limbo where they came from. 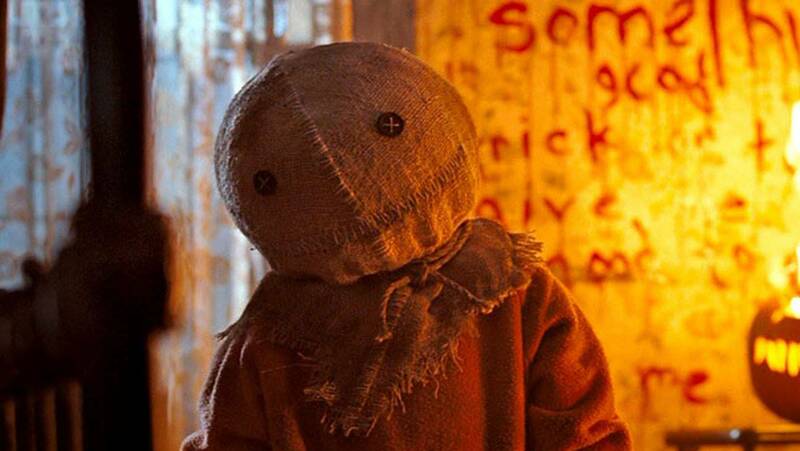 Sam is by far our favorite burlap sack-headed tiny trick or treater. He spends Halloween night perusing around town and collecting his candy while all of these spooky and gruesome events happen in his presence. Turns out that Sam shows up whenever someone breaks a Halloween tradition and then things go horribly, horribly wrong. Trick 'r Treat is a 2009 anthology horror movie, that weaves together five super-scary stories that are all happening at the same time in the same town - Halloween night has never been more creepy. A dorky high school principal has a secret life as a serial killer alongside of his young son, a college virgin is searching for the right guy at the local Halloween parade, a group of teenagers pull a mean prank on a nice girl with special needs, a woman who loathes Halloween traditions has to deal with her pumpkin obessesed husband, and a mean old man meets a demonic trick or treater after he won't hand out any candy. If you pick ONE movie to watch on Halloween, please choose this one! Or all the scary-spooky Halloween movies on this list that aren't actually Halloween. We still love you, Michael Myers!